I have a new love- Bible journaling! I was bouncing around on Pinterest and kept seeing these beautifully illustrated pages in people's Bibles and I knew it was for me! It has really changed the way I read the Bible. I am more invested in making connections with the Word creatively and more personally. It has really brought the scriptures to life for me! 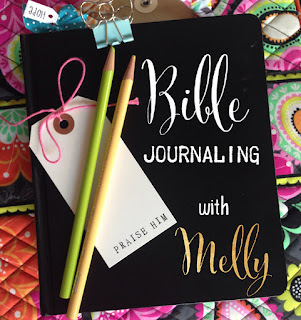 If you are interested in getting deep in the Word and want to express your faith in art or just love to take notes in your Bible, you must try Bible journaling! There are a bunch of resources out there from free designs you can trace right into your Bible and color, to videos of different journaling techniques. I would definitely start with a great blog called Illustrated Faith. Shanna Noelle and her team have tons of ideas on incorporating art into your Bible study. Another great online resource is Stephanie Ackerman's Documented Faith. I just love her style and bright use of colors. She also has lists of her favorite tools and you'll find lots of great ideas in her "doodles" section. Right now, I'm just using a couple really old sets of watercolor pencils-- a Kimberly 12-pencil set and a 24-pencil Derwent set-- and my favorite pens- Micron pens by Sakura. My watercolor pencils are like twenty years old. I'm excited to get use out of them! I have both the double-column and the single-column versions of the ESV Journaling Bible by Crossway which you can easily find on their website, Barnes & Noble and Amazon.com. Aside from the cream-colored pages, they are just perfect for journaling. The only thing you have to be aware of is the amount of water you use with watercolors and the kind of pens/markers you use. The pages are a bit thicker than your old trusty Bible, but not by a lot. I think the best way to start is to pick a favorite verse that has a strong visual you can sink your colors into. Once you are comfortable coloring or lettering in your Bible, you may want to follow along with a Bible study or with your sermon notes. Some people stay in the margins and incorporate stickers in their notes. Other people use acrylics and stencils and all sorts of mediums and cover entire pages. There is no right way to journal in your Bible, just do what you feel led to do. Keep your heart fixed on God and your eyes fixed on the Word and you will be blessed!